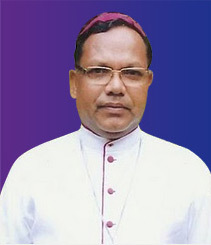 The Diocese of Daltonganj was formerly part of the Ranchi Archdiocese. It was constituted as a separate diocese in 1971, and comprises the civil districts of Hazaribagh, Palamau, Garhwa, Bokaro, Chatra and Koderma. At the time of erection into a diocese, Rt. Rev. George V. Sauipn, sj. was the First Bishop. For the better pastoral care of the faithful, on May 12, 1995 the Diocese of Hazaribagh was established with the territory taken from the Daltonganj diocese. At present the Diocese of Daltonganj comprises of the civil districts of Palamau and Garhwa.